For about 5 years to mid-2016 I had been testing and integration of a LiFePO4 battery with my off-grid solar PV system and its main (gel) lead-acid battery bank. That experiment ended May 2016, partly to make things simpler and enable a big PV upgrade. Hey Siri, Flatten the Duck! RPi System power management C++ source code, makefile and snapshots, and README/changelog. 2016/05/22: LiFePO4 (LFP) battery removed and all PV input is now feeding to the ~400Ah gel lead-acid (LA) bank. The ~400Ah of lead-acid was itself integrated into the system 2011/01/14. The 'test' is done after ~5 years! The observation is that the combination works well, but the complexity and partitioning of available energy may not be worthwhile. 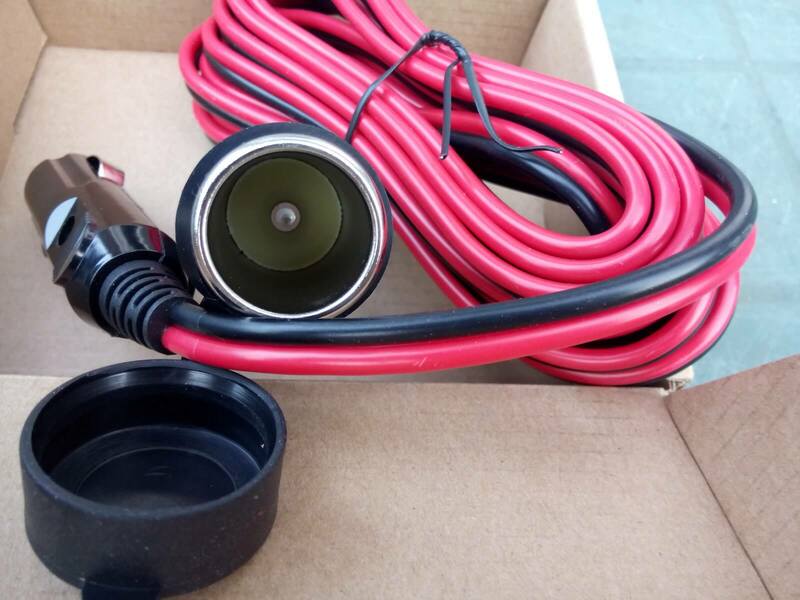 In May 2016 I also beefed up the lead-acid battery wiring with purpose-made cables (35mm^2 cable, length 25cm, lugs M8) between batteries as well as back to the controller, to minimise impedance and losses. In October 2017 I brought an additional direct (separately fused) connection from the battery bank to the house to be able to run heavy loads such as a car kettle or a small inverter. In August 2018 I installed an Enphase AC-coupled grid-tie LiFePO4/LFP Battery, so lithium is back in the house! I quite fancy a 12V kettle instead of using the 3kW mains kettle; at ~30Wh per cup, maybe 180Wh/d. Rated 10A, so well within wiring ratings (~20A for 4mm^2), but given 15s@3kW, and this being 25x slower, ~6m to boil water for a cuppa (eg when the sun is out) seems plausible. 2016/05/27: LA battery getting first good solid uninterrupted absorption charge in a long while (11:10Z--14:20Z ie 3h @ 14.1V). Here is the simplified system's schematic (PDF). The big 5kWp+ grid-tied array on my roof only generates an average of about 1.5kWh/day mid-winter out of our ~5--6kWh/d demand. Were the big array south-facing rather than east and west, it would generate maybe double, though, realistically, I wouldn't have that much roof facing south! I have a very limited amount of south-facing wall relatively unobstructed, particularly from just before noon mid-winter when the sun-arc is small. My target is to obtain ~500Wh or ~10% more of our daily electricity demand (also can be viewed as capturing one third more energy daily) in mid-winter by expanding the PV system somehow. The south-facing wall space is occupied by a motley collection of 12V-nominal panels, not maximising energy collection ability, and the previous complex LFP and LA separate strings made such maximisation difficult while being kind to all the batteries, thus the reason to scrap the LFP element at least for now. There is maybe at best (without anything too ugly by my low standards) ~4m by ~1.5m usable space, though partially shaded, realistically a maximum of 500--700Wp might squeeze in there. rails from above, at edge of roof. So about 34cm/13.5" rail centre to rail centre and about 3m/10' long in an ~1m gap. And I have a bag of miscellaneous fixings/fastenings which may be Unirac Solarmount or very similar, in which case I seem to have 8x C clamps (1+7/16") for 33--36mm module thickness which accords with the 35mm-thick installed Sanyo HIT-215NHHE5 panels. As of 2016Q1 it might be possible to easily place 250Wp--600Wp up there. So I could reasonably hope for 500Wp+ south facing (~500Wh/d mid-winter), and 300Wp shallow west-facing which could help when overcast and in afternoons. The existing size of my grid-tie system (above G83 limits) and the presence of an export meter receiving FiT (Feed-in Tariff) means even the paperwork for connecting a small amount of extra PV, eg with microinverters, would probably be horrible. The usable capacity of my (probably somewhat tired) 12V 400Ah gel lead-acid bank is well above the 500Wh/d target, and so it seems easier to capture that extra energy off-grid and find sensible ways to use it from there. For example, it could be worth adding an inverter and transfer switch to take our mains lighting load off-grid when the battery SoC is decent, and the demand from our lighting is probably a similar amount. Or, for example, making sure that the current loads (RPi+networking) are off-grid more of the time, which might be close to that 500Wp, with some opportunistic loads such as a 12V kettle to make use of some excess. 2016/05/29: the current plan implies preserving some of the existing panels (maybe ~160Wp) on a nominal 12V string, while putting two 260W panels on a nominal 30Vmp string (one on the roof could join them) in prime spots vertically mounted to minimise clutter and reclaim some patio! And maybe one more 260W panel could be roof mounted when I am feeling brave, though I may choose to wire it on as well as clamp it, given my inexperience! It looks as though the Unirac fixings I have would accommodate my current 100W 12V panel (NES40-5-100M, 40 cell, 20Vmp), lengthwise (probably not ideal for wind loading), and would not accommodate (in terms of panel thickness) the cheap 260W panels that I have been salivating over. 2016/05/31: aluminium (wall-) mounting backets arrived today, and I have tested them out with the ES-62T (62W, triple junction, 10kg) panel. I will need to up my game at least a little when mounting heavier (18kg) panels. (f) + (e) are targetted for 250W+ panels (~1650mm x ~1000mm) as having the best (mid-winter) generation potential. See panels in sections e/f/g below. 2016/06/05: some small potted plants have materialised below the 60W panel, hurrah! Also chatted today with builders about getting the 100W panel on the roof while we get some guttering issues fixed. I'm writing this after sunset, with the server, Internet connection, laptop and desk light all off-grid (the laptop on its own battery). 2016/06/11: significantly re-arranged and tidied (and shortened) wiring from panels, now not coming into the house at all, to make separate running of ~17Vmp and ~30Vmp strings to controllers near battery bank possible; currently the two circuits are combined at the controller and the '30Vmp' circuit is still being fed by the ES-62T panel. 2016/06/15: ordered some Schottky dual diodes (common cathode) 20A 100V to combine the two large panels in TO220AB and TO220FP packages (the FP, NTSJ20U100CTG, insulated tab, makes heatsink management easier). At worst the diodes might have to dissipate 10W (0.5Vf@20A for ~600W@30Vmp), but given for example a maximum 200W handled by the SS-MPPT-L a peak diode package dissipation of ~3W is more likely. 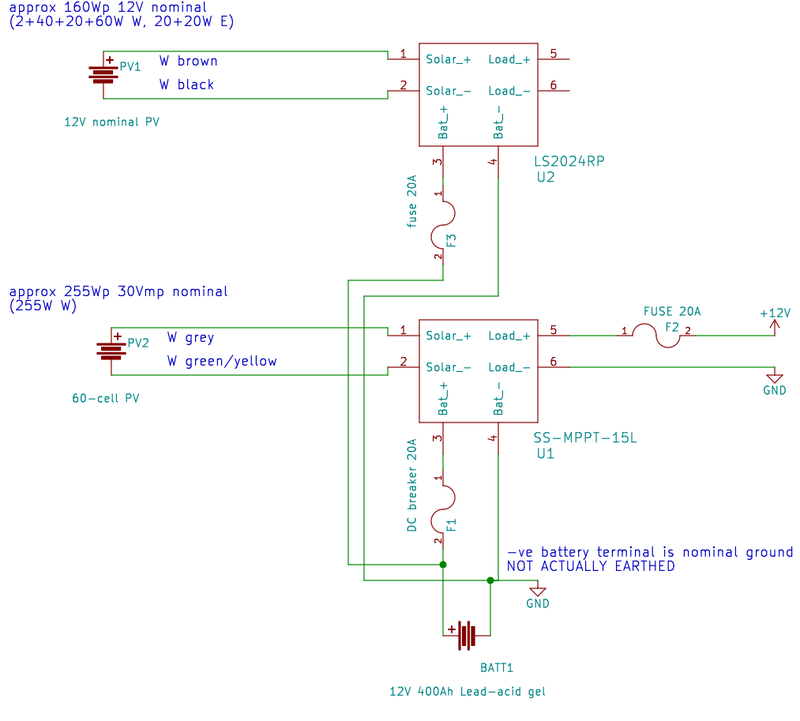 2016/06/22: have ordered a cheap 12V-nominal PWM solar controller to test. Bigger picture: given the very cloudy (climate-change 'blocking' jet-stream) weather and poor solar generation that we've been having for weeks, along with a huge drop in (retail) PV prices per Wp, I'm more and more inclined to think that overspecing PV wrt to inverters/controllers and demand, to deliver useful output on non-sunny days, eg now and in the winter, is a generically sensible approach. (AKA 'inverter loading ratio', ILR.) 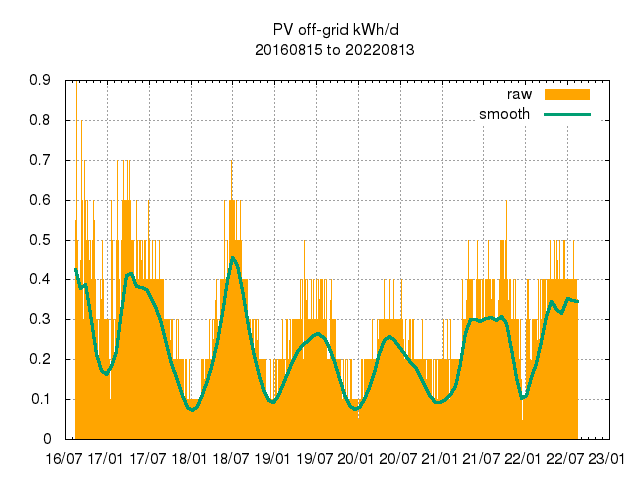 Don't maximise mid-summer output: optimise for cloud and winter and dump excess happily and safely in the way that PV almost uniquely allows. That helps to provide something useful and zero-carbon year-round, with some opportunistic extra fossil-fuel (etc) avoidance in summer. 2016/06/25: hmm, wrong PWM controller arrived yesterday; hoping for next week. 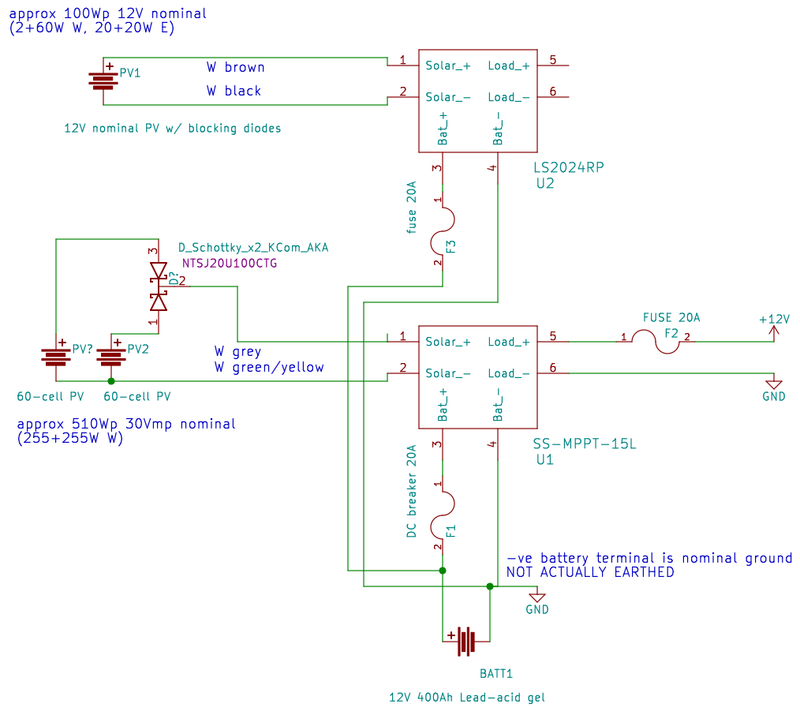 Meanwhile here is the proposed new schematic showing some of the 12V string moving to the new controller as an experiment to make sure that it still works reasonably well. With PWM as this new cheap 'temporary' controller is, there is some expected loss of available power into low batteries cf MPPT, eg in the morning where these panels on the east of the house seem to have been especially useful. Note that the LS2024RP is positive earth, so for example the -ve string lines cannot be parallelled. 2016/06/26: a LTC4151 might make a nice high-side power monitor for my off-grid solar panels with an input range 7V to 80V (so good even for 17V and 30Vmp panels) and an I2C interface ready to talk to a low-power MCU such as V0p2 REV11... One such V0p2 could listen to 8 such devices and transmit stats by radio, being powered from the string at the combiner box. The MCU could also drive 'ideal diode' (P)FETs for the key string panels to minimise losses, while lower-power 12V-nominal panels could maybe directly use (say) a LTC4358 or a AUIRF4905STRL P-channel MOSFET Transistor, 70A, 55V 'backwards'. Note that the saving is likely of the order of 200mV at ~10A, so 2W, so it is reasonable to ask if the <1% savings from a ~200W+ panel is worth the complexity and cost, beyond simply establishing that it works. Most pertinently at the moment, with an under-specified controller, are there real savings at low powers and light levels in winter when needed. Eg at 30V/30W/1A the savings may be more like 300mV and therefore 300mW at 10% generation (typical overcast winter) output, still at the 1% level. Routing: the new cable run is split and is easy to knock while working on other things so longer (lug-terminated) cables should be installed. Bank attachment points: the battery connections for the new controller land on opposite corners of the bank, but the two other corners from the MPPT controller. This is a little controversial but is in the end expected to be a minority of the charge input and not a power drain point. So even if not sorted when the controller wiring is fixed, will probably not prove to be a problem. Now also in possession of (ratchet) socket set including 8mm socket for panel fixings: finished off existing ES-62T (60W) panel mount. 2016/07/03: my first M4 connector with crimping to replace failed one in -ve lead of 100W panel that had been temporarily replaced with a connector block. I am not at all convinced about the new connection; 4mm^2 wires pulled out even when re-crimped on smaller setting, so backed up with solder. Also, the M4 connector evidently did not mate properly the first time (no connection, detected by lack of foward bias at diode in junction box) so took it apart and removed stray solder blob and reassembled. Connection now apparently working but I will keep observing; this one may end up difficult to access on the roof so its integrity is particularly important. 2016/07/21: hurrah! Two substitute (Canadian Solar CS6P-255P) panels arrived, so now I just need the fixings etc to put them up and wire them in. I expect to upgrade the system in stages, eg putting up just one 255W panel first, alone feeding the SS-MPPT-15L, having moved all the residual 12V-nominal panels to the PWM string, retiring the 100W and a 20W panel at least temporarily. CS6P-255P spec: 255Wp -0+5W, 30.2Vmp, 8.43Amp, 37.4Voc, 9Asc, module effciency 15.85%, -0.34%Voc/C, normal operating temp 45C (+/-2), (NOCT 800W/m^2, 20C: 185W, 27.5Vmp), polycrystalline, 60 cells (6x10), 19kg, 1638 x 982 x 40mm. 2016/07/22: (noon, 11:00Z) swapped over the strings and controllers: the brown/black pair that will be all the 12V nominal now feeds the PWM, the grey/green pair that will be the 30Vmp panels now feed the MPPT. The latter (grey/green) pair currently has the 60W (ES-62T) panel on it. 3pm (14:00Z) the first 255W CS panel is connected up (not yet cleaned) but the aluminium brackets don't seem to fit it, so it's just propped up against the wall for now (bah! again!). The CS panel is connected to the SS-MPPT-15L with no blocking diode, the 60W (ES-62T) panel has been moved to the 12V string, and the 100W+20W have been disconnected. A significant jump in battery voltage suggests that everything is working (on top of testing various points with a multimeter...). The positioning of the CS mounting holes along the edges is not as good for me as the JA panels as I have to mount this vertically on a wall and the furthest down from the 'top' edge might be above the top of the wall! So I am faced with possibly drilling new mounting holes, which worries me somewhat. 2016/07/23: some full sun on the new panel arrangement today, with the battery voltage shooting up to absorption, then sitting at float for several hours (second day of those shown), which is exactly the type of behaviour I am hoping for. (Plus the tweaked powermgr behaviour allowing dumping to ride through brief dips into HIGH and OK.) The rise to absorption happened almost as soon as the sun came round the house to hit the new CS panel. 2016/07/25: a couple more days with interrupted sunshine, but the battery is clearly getting to something like float and getting a good charge. 2016/07/30: did first test hole in frame where it can work with the Al brackets. Somewhat slow with the hand (battery) drill, but not much drama. Had tape on drill bit and a ceramic tile and thick magazine behind hole to protect back of the panel if need be, but need wasn't. 2016/08/01: with the help of my kids, got the (second) CS panel mounted. More bodging, but it seems OK, with much of the load bearing directly down through a brick to the ground rather than being taken by the wall. Not convinced that it's electrically right, looking at the battery graph, even though it's an overcast day. May need TLC later. Did measure ~33Voc, and 29V when connected up, which is promising. (e) remains due the second 255W panel. 2016/08/03: making the extra holes in the second CS panel frame for mounting. Adjusting the hole positions slightly to try to hit mortar less. Adding extra mounting hole at bottom hoping to help load distribution, also more allowance for 'bad' mounting holes generally. Have taken down the 40W amorphous panel and removed the 20W 'floating' one. 2016/08/04: am: mounted and connected the second CS 255W panel. 2016/08/07: have lashed up MacBook Air via car (12V) universal 70W laptop regulator (Maplin N59AC) set to 15V and so I am back to being able to run my Mac off-grid, eg as a dump load. Note that the N59AC is not very efficient (~80%?). I happen to be able to charge my phone via the laptop this way too. Can aim to run server+Internet+light+MBA+phone off-grid all year this way. 2016/08/08: I will try to measure battery voltage at the battery using the SS-MPPT-15L controller over MODBUS over RS232 so I will be ordering a PC MeterBus Adapter. This should largely eliminate the effects of voltage drops in the supply cables when estimating SoC (leaving genuine sag from the battery bank itself). This should also allow measuring (some of) the power flow into the bank, and out to the loads. The are various solutions for having the RPi talk MODBUS to the SS-MPPT-15L, though I may prefer to keep everything in C for efficiency and use the LGPL libmodbus (see RPi build notes). Also see SolarNetwork in Java. which indicates that ~60W of power that could be used is not because the batteries are getting full and the ~40W of load that I have on at the moment is not enough to absorb the rest. (Why with both CS panels in direct sun the Pmax isn't nearer the controller's 200W maximum, I don't yet understand.) Note that this is ignoring power/charging from the 12V-nominal string via the other (PWM) controller. Oh, and as of yesterday the SS-MPPT-15L claimed that it had put a total of 202.5kWh of charge into the batteries over ~60,000h. And that keeping my battery bank in absorption takes ~60W, which would have been difficult to do with only ~140Wp of sun-facing panel at noon mid-winter. Float appears to soak up ~25--40W. The main charging window at the moment seems to be ~10:00--16:00Z. 2016/08/16: I have started collecting some cumulative off-grid stats. In particular cumulative generation (kWh) as reported by the SS-MPPT-15L. It seems evident that unlike the grid-tie PV which generates all that it can and exports it to the hungry grid, the off-grid system is only going to 'generate' at most the load plus any system and battery losses, ie providing more load may increase the reported generation. 2016/08/18: operating the battery DC breaker to the SS-MPPT-15L works, ie it produces a battery fault, but it does not result in the load being disconnected, so I am likely to replace the load fuse with a 20A breaker somewhere easy to access. Also, measuring the voltage drop across the (20A MAXI) load fuse showed 15--25mA at an assumed ~2A draw, thus implying ~10m&ohm; rather than the expected ~3m&ohm;. Inspection also shows that I could probably take another 1m (9m&ohm;) out of the cable run back to the house/load from the SS-MPPT-15L, so maybe ~20m&ohm; or 20% max that can be taken out of the load circuit. The run upstairs can be doubled up also to reduce losses to the Mac adaptor which at ~70W peak (~5A) dwarfs the normal loads; maybe 100mV out of the ~500mV drop (~4% to ~3%) to it could be eliminated. Some of this navel-gazing is because there has been quite a lot of power-LED flickering on the RPi, and it hung at 2am two days ago, which may be related. I adjusted some parameters (eg on the Gallery) to be less aggressive on power use but there is still some flickering. I may tighten up the supply (eg shorten leads, improve connections) from RPi all the way back to the solar controller to alleviate this issue and to reduce marginal losses. 2016/08/20: load fuse swapped out for circuit breaker and tested. No obvious change in load supply impedance to RPi observable. 2016/09/02: observation suggests that at least at this time of year output of primary panel array is 1/2 to 1/3 of that of grid-tie pro rata. For example, at at rather dark 13:12Z the grid-tie was generating 183W and as 13:16Z the primary array was generating 9.9W (presumably heavy cloud). Given relative array sizes maybe 18W would be expected. It will have to be seen how this effective efficacy ratio changes though the year (hopefully for the good in winter). suggests ~40m&ohm; internal battery impedance and a further 100m&ohm; towards the load at least at the Vbus sample point mear the RPi. The latter figure confirms earlier values, the former is possibly higher than expected, though may be partly measurement granularity at the controller, and partly caused by 3 days' relatively poor charging (no float, little or no absorption time). 2016/09/05: checked output of the two CS 255W panels with multimeter in overcast conditions. Each separately delivering ~330mA Isc (~10W) and into the MPPT controller, so ~20W total vs ~560W from grid-tie system. So CS panels delivering ~4% of rated/peak, grid-tie ~11% of rated/peak, so confirming the 2x--3x ratio in actual:rated for vertical panels vs roof. May be extra good to get the 100W panel on the spare roof rails! 2016/09/07: a few dull days and the system is starting to struggle, so have prioritised different calls on dump load; according to PVGIS this should be one of the better months! But then all looks good with ~3 hours of 200W+ charging (~800Wh for the day), though not quite enough to hit float and thus 'FULL' status. which implies consumption fairly close to the 500Wh/d generation target. Parallelled +ve connection (and generally improved) from power cupboard to desk to better support heavy recharge demand from laptop, and shortened power route to RPi in hope of reducing measured supply impedance and red power light blinking (but it is still blinking when RPi is working hard). 2016/09/11: voltage drop debugging: noting snippets of output from ssmppt15l-modbus and powermng -v under reasonable load (recharging my laptop at ~40W) there is as much as a 500mV from from battery to Vbus (at the RPi), though 246mV is shown in this snippet, of which 100mV is between battery and the load output of the SS-MPPT-15L. Input flag DUMPING is unset. External flag file /var/log/SunnyBeam/LOW.flag is absent. Battery voltage 1 local (LA) 12197mV, 2 (Li) -1mV. Supply drop B1 to BV 246mV; implied supply impedance 0.106401ohm. Extending the (verbose-mode-only) calculation inside powermng to use load terminal voltage explicitly yields a slightly more comforting snippet, ie that a significant chunk of the voltage drop (possibly a quarter to a third) happens before my wiring loom, indeed before the controller's load terminals. Verbose mode ($Id: powermng.cpp 15411 2016-09-11 08:40:19Z dhd $). Battery voltage 1 local (LA) 12262mV, 2 (Li) -1mV. Supply drop B1 to BV 211mV; implied supply impedance 0.143342ohm. Supply drop controller to BV 135mV; implied wiring impedance 0.091712ohm. 2016/09/14: two days in a row hitting FULL though interestingly float state at the controller can persists down to ~13.2V ie at a voltage that I consider merely 'OK'. There seems no quick way to interrogate the controller to find when it last considered the battery full, ie in float; reading up to 32 days' historical data (of 32 bytes each) might be needed. even after hitting FULL, unable to sustain anything like 500Wh/d load after a couple of bad days; is the battery near death? somehow still unable to suppress dump oscillations completely yet. Verbose mode ($Id: powermng.cpp 15563 2016-09-24 23:11:42Z dhd $). Input flag DUMPING is set. LA/B1 dynamic threshold downward adjustment for load current 300mV. Battery voltage 1 local (LA) 11849mV. Supply drop B1 to BV 648mV; implied supply impedance 0.110826ohm. Supply drop controller to BV 551mV; implied wiring impedance 0.094236ohm. though note that 4mm^2 is down as 9.22m&ohm;/m (two way) so ~6m from controller to RPi should be ~55m&ohm;. The 20A DC breakers on either side of the controller should be similar to a MAXI 20A fuse, ie ~3m&ohm; each, So still a mystery 30m&ohm; between controller and RPi! To put this in context, at a minimum RPi-only draw of ~1W (~80mA), ignoring draw by the controllers, the wiring losses etc from battery to RPi (@~130m&ohm;) are ~10mV (~0.1%); the loss from the redundant Schottky diodes just upstream of the RPi is probably ~350mV (ie ~3%) so possibly worth fixing. For the RPi+networking load of ~1.3A, wiring losses from the controller are ~120mV or ~1% at most. I can shorten the wiring loom or parallel up the unused cores to save ~30m&ohm;, but it is not a priority for now. Note that the laptop power adaptor no longer 'screams' under heavy load (~60W); doubling the wiring run to it from downstairs seems to have been worthwhile. The sag/drop to BV, the RPi 12V input, was ~700mV, implying 140m&ohm; total supply impedance to BV. Also, with the aim of making full and more precise use of my available storage during the (cold) winter, I have attempted to fold in some code support for temperature compensation of voltage set-points at the low end in particular, and so I am also logging/recording the battery temperature (using the Morningstar remote probe attached to the battery). It will be interesting to compare that to general exterior temperatures, eg observe time lags. I have set an initial base temperature of 20°C and 24mV/°C discharge, ie the thresholds for SoC levels drop with temperature, as per Victron advice, though I note that the SS-MPPT-15L uses 25°C and 30mV/°C for adjusting its setpoints. The slope is likely more critical (given that I am happy with my current setpoints today at 20°C) but I may adopt the Morningstar slope later. 2016/09/30: yesterday ~1/2 kWh was generated by the main off-grid array, with a rolling average of ~1/3 kWh/d, so below target. 2016/10/04: "Use it or loose it" experiment and data sample. Verbose mode ($Id: powermng.cpp 15710 2016-10-13 07:35:43Z dhd $). SS-MPPT-15L T_batt (C): 13, discharge compensation -210mV. 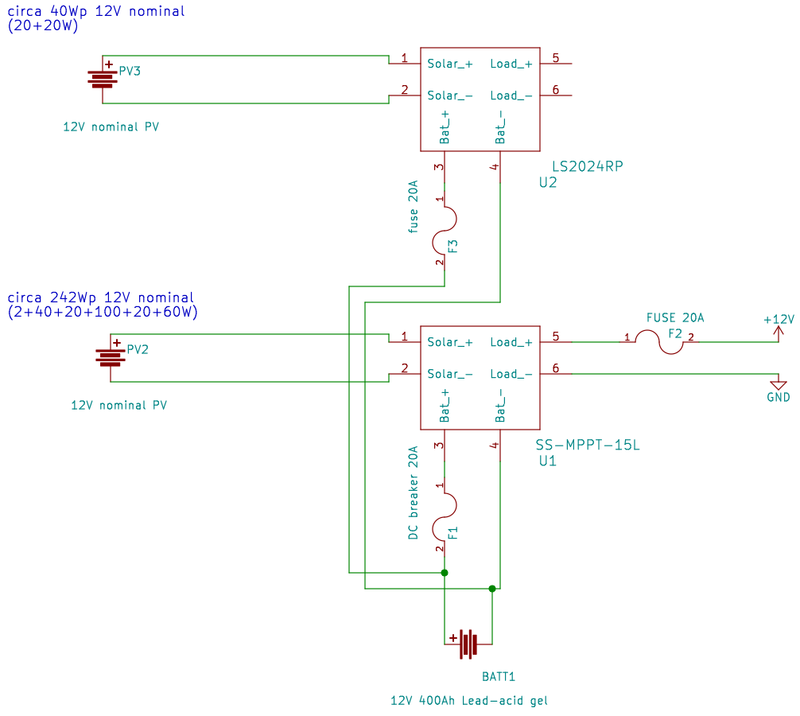 LA/B1 dynamic threshold adjustment for load current -300mV. Battery voltage 1 local (LA) 11690mV. Supply drop B1 to BV 591mV; implied supply impedance 102mohm. Supply drop B1 to controller load terminals 73mV; implied controller impedance 12mohm. Supply drop controller to BV 518mV; implied wiring impedance 89mohm. 2016/10/30: am: having to resort to charging my MacBook from mains rather than the off-grid system for first time since the new panels went up, given the laptop near empty and the LA battery 'Low' this morning after poor insolation (particularly fog and thick cloud yesterday, fog this morning). The SS-MPPT-15L indicator was amber yesterday, so I'd like to let the battery get some charge and get back to green (13.1V). The 40W panel was connected to the secondary string/array and was live ~14:30Z, and the secondary string is now ~140Wp. 2016/10/31: it appears that imports from the grid dropped about 6kWh this month compared to last October (106kWh vs 112kWh) according to Pilio/sMeasure/iMeasure though gross consumption (I+G-E) has gone up up 6kWh while off-grid generation from the primary array was a similar ~10kWh. Not all movement of consumption off-grid happens at a time when it reduces imports, eg when the grid-tie is already causing net-exports. Taking load off-grid at night does directly save grid imports. Note that ~2.5h of weak sunshine through haze where grid-tie hit ~1/3rd of max (thus maybe equivalent to nominal 1h/d full sun expected mid-winter) was able to hit the full ~0.5kWh/d target charging at a solid ~200W. This was probably only possible because the PV is overspecified >2x. 2016/11/12: sag with the fixed (networking equipment) dump load has risen to ~120mV with the LA battery at ~8°C, so rather than keep manually adjusting the constant in the code that allows for impedance-based sag, I have added temperature compensation, initially at -7m&ohm;/C, ascertained empirically by raising it from ~4 until dump oscillation stopped. 2016/11/29: with outside temperatures near freezing and the battery ~6°C, I have raised the impedance temperature compensation to -13m&ohm;/C, as oscillations have been nudging in again. 2016/12/01: raised the impedance temperature compensation to -15m&ohm;/C to help damp oscillations seen with battery at 2°C. 2016/12/15: so far the goal of 0.5kWh/d off-grid is being missed hugely; the running average is more like 0.2kWh/d now, close to winter solstice. Daily output is hugely variable, with more than an order of magnitude difference between today and yesterday (~0.4kWh/d). 2016/12/22: a respectable generation of ~400Wh today, with the running average a little over 110Wh/d to yesterday. 2016/12/29: there definitely seems to be an element of 'use it or lose it' when the battery is cold and thus unable to absorb much charge. Shortly after noon, adding a ~50W load from my MacBook saw primary generation jump by a very similar amount, with the battery voltage remaining flat at a little over 14.5V (battery at 3°C). Possibly for a number of reasons including reduced battery bank capacity when cold (and it has been the coldest winter for a few years), the target for 500Wh/d of generation from the two large panels has not been met by a long chalk with a low around the solstice of more like 150Wh/d. Code snapshot taken with what appear to be decent temperature compensation values. 2017/04/07: battery hit 'full' two days in a row according to the Morningstar controller; notice the float 'shoulder' on the right for the second day. 2017/06/20: I think that I could have the temperature coefficients rather wrong; the internal impedance etc is computed so high at 30°C that the battery could not dump unless on fire or something! Verbose mode ($Id: powermng.cpp 15983 2017-01-19 17:11:57Z dhd $). SS-MPPT-15L T_batt (C): 31, discharge compensation 0mV. Estimated LA battery impedance: 65440mohm. Estimated actual battery sag from load (mV): 0mV. LA/B1 dynamic threshold adjustment for load current 0mV. B1 and wiring dump load sag allowances 18947mV, 194mV. Battery voltage 1 local (LA) 13107mV. Supply drop B1 to BV 190mV; implied supply impedance 254mohm. Supply drop controller to BV 172mV; implied wiring impedance 230mohm. Input flag EXTERNAL_BATTERY_NOTVHIGH is set. Input flag FORECAST_PV_GEN_GOOD is set. Battery voltage 1 'very low' threshold 12100mV. Battery voltage 1 'low' threshold 12300mV. Battery voltage 1 dump margin threshold 31297mV. Battery voltage 1 'not high' threshold 13450mV. Battery voltage 1 'very high' threshold 13600mV. Input flag NODUMP is unset. Insufficient margin to dump, threshold 31297. SS-MPPT-15L Power_out A1P (mW) 19236. // Increase in sag per C below base temperature (eg 20C). // Allowance mV/A for supply drop due to controller+wiring impedance (mohm). 2017/09/18: to buy or not to buy? Do I need to splash out a grand? The lead-acid bank's capacity is looking increasingly dire, and I asked in this thread on Fieldlines for ideas on a possible replacement bank. A suggestion from clockmanFRA, and that I've vaguely considered in the past to help protect against sustained over-discharge in the winter, is simply to limit the depth of discharge (DoD). He suggests 10% DoD max with leisure batteries as a radical approach. I won't do anything quite that drastic yet, but I am right now creating 'conservative' / 'low-DoD' settings for my bank voltages to see if that keeps the bank healthier. If I'm not trying to power external loads, keeping the RPi running should be easy. I may this more dynamic by greatly raising the thresholds in the absense of (say) forecast sunshine, or recently hitting 'full'. Installing the updated code has pushed my bank from being in an apparently 'OK' state to 'VERY LOW', and the system should draw much less juice from it until the SoC rises significantly. This will greatly reduce the nominal capacity of the bank, though if it reduces sulphation of this bank or its replacement, maybe less so than it appears on the surface. See the new scheme graphically, along with mean temperatures and available sunshine dropping. 2017/10/01: as expected, especially on dull days, I'm seeing relatively little dumping, with a much-improved minimum/overnight voltage. // LOW threshold: ~85%/100% SoC un/loaded. // VERY LOW threshold: ~75%/90% SoC un/loaded, with some line voltage drop. // LOW threshold: (LESS_DoD) ~85%/100% SoC un/loaded. // VERY LOW threshold: (LESS_DoD) ~70%/85% SoC un/loaded. These threshold values, compared to those of a few days ago, may allow use of another 10% of raw/nameplate capacity (ie 20% of usable capacity) while guarding against further premature damage and capacity loss. See the slightly lower overnight resting voltage. 2017/10/14: I was concerned that the powermng program itself might be starting to eat significant CPU time and thus energy, since it is now fiddling with increasing numbers of (eg) governor parameters and thus incurring extra context switches, etc. But actual user and system CPU time is still very low, maybe working out as 10ms every 10m run. 2017/10/14: a number of places in the code have been slanted to aggressively try to move the (dump) load off-grid, eg to help reduce the house's demand from the grid overnight and whenever the grid-tie system cannot cover house loads. With LESS_DoD true I now tweak compile-time thresholds so as to be less keen to prop up the grid, and instead prioritise preserving battery life (and reserve to run the RPi). However, when the grid needs some TLC (eg peak demand, peak carbon-intensity), this system will still try to help by covering maybe one-quarter-billionth of GB demand! 2017/10/16: I've now separated the externally driven dump demand into high-priority items (high grid demand or carbon intensity), and the rest, and only allow the latter group to trigger dumping (when LESS_DoD is true) when the battery has gained significant net charge during the day. The aim is to promote battery health and an increasing SoC until the battery is hitting FULL. (I may need to add specific code to allow the low-priority dumping when recently FULL.) I may want to add the "only when gained charge on the day" condition to other places too. You can see dumping stopping early and then correctly resuming later during high grid carbon intensity. The early stop was caused by heavily overcast orange skies caused by dust and smoke brought in from the south by a hurricane while it was monstering Ireland. There are now two new status code letters in the log: 'N' for not enough net charging in the day for anything other than high-priority grid support, and 'E' for those high-priority factors such as peak grid demand or carbon intensity. 2017/10/20: a significant semantic upheaval is now under test: VHIGH now indicates passing the specified voltage threshold and reaching absorption (or float) which implies a thorough (and efficient) charge. The 'H' timed start to dump is now upgraded to 'A' indicating having reached absorption (and been HIGH for long enough). 'N' now means that low-priority dumping is blocked because there has Not been a recent decent charge likely to avoid sulphation amongst other limits to DoD. A recent VHIGH no longer just implies a brief spike from the big panels, but instead leans on the charge controller to be an indication of a decent SoC, ie out of 'bulk' phase. 2017/10/21: back to "use it or lose it": in this case Sweep_Pmax greater than Power_out and Load power suggests that the battery cannot accept (much more) charge and the panels connected via the PWM controller are providing ~6W. This does strongly imply that the dump load should make use of the energy that is otherwise being wasted. 2018/02/07: FULL (since Wed Feb 7 13:20:08). Hurrah! 2018/02/28: Cold! More 'FULL' episodes over recent days, but with temperatures steadly falling (to 0°C at the battery bank, -2.5°C in the porch early this morning) the voltage margin 'm' at night is not enough to avoid dropping into VLOW just before dawn. So maybe set the temperature-adjusted margin to reflect the coldest forecast temperate during next 12--24h (or until dawn if the sun is down) to avoid this? 2018/03/05: Colder! A bit colder outside and the battery bank several days at 0°C. I don't know if the battery temperature sensor read remotely this way can show negative values, so the battery may have been colder than shown. To test the "use it or lose it" hypothesis further, I ordered a 12V kettle and an in-cup immersion heater, both maybe ~150W, giving me two orders of magnitude of loads from RPi through networking gear to kettle. I'll have to be careful that the kettle load doesn't hurt the solar controller nor crash the RPi by yanking the supply down too far. The controller maximum load is 15A, thus ~180W. It could struggle with simultaneously powering the networking gear and kettle. The goods arrived 2017/10/25. Brief tests of the loads direct to battery, with bright sunshine on the main panels, to measure actual power consumption of the devices, suggest that they would only just just squeak in on the controller's 15A max load (~180W), and that would be slightly dodgy if the network dump gear was engaged. Note that the battery was absorbing ~10W throughout these tests. In any case this shows that the panels were happy to supply enough for a cup of tea with the sun out, and the batteries were simply not absorbing what was available. I have a spare pair of meaty conductors from the batteries to the kitchen plus a spare 20A MAXI fuse, so I may well wire them in to get an off-grid cuppa facility. It seems fairly clear that, as right now, I should probably power my laptop off-grid when the sun is bright on on my 550W of panels; it's energy otherwise going to waste! A subsequent test of the kettle (again 200ml water, a better direct connection to the battery bank) had the water getting hottish after about 8 minutes and just boiling in about 20m. Quite a lot of this energy goes into making the kettle itself warm! Full log. 2017/10/29: instead of doing other things I ought, I have started wiring in the direct 12V feed to the house from the batteries, bypassing the controller. The -ve/0V/GND rail is electrically common with the output of the controller (GND is straight through). It could possibly be commoned at the house end to reduce cable losses from normal loads by 25%, at the risk of setting up unexpected circulation currents from a non-star topology. The +ve/12V will be separately fused (20A MAXI) as near the battery as possible. A test cup of coffee was made with the kettle direct to the battery, purely for engineering purposes. (Instant) coffee was deemed more efficient than tea in this instance as the water need not come fully to the boil for an acceptable result. The energy used is revealed partly by an imbalance between generation so far today (~167Wh) and controller-supplied load (~53Wh) at 13:00. This will allow running intermittent loads up to ~200W in the house, such as the 12V kettle, or immersion heater, or small car space heater, or even in future a small inverter (such as I already have) in case of power cut. For sustained load I would need to improve connections and wiring. Verbose mode ($Id: powermng.cpp 21322 2017-10-21 20:23:55Z dhd $). SS-MPPT-15L T_batt (C): 14, discharge compensation 0mV. Estimated LA battery impedance: 176mohm. Battery voltage 1 local (LA) 14148mV. Supply drop B1 to BV 184mV; implied supply impedance 166mohm. Supply drop B1 to controller load terminals 19mV; implied controller impedance 17mohm. Supply drop controller to BV 165mV; implied wiring impedance 149mohm. 13:36: a second engineering coffee is being prepared, this time with the kettle in the kitchen (hurrah). The RPi did not go down (I had run sync just before starting, on the off-chance). There is sun, but only ~35W of generation available from the main panel due to shading issues. The present cigarette-lighter connector is getting a little warm, and should be upgraded with something more mechanically secure also. After ten minutes the water was deemed just warm enough for the coffee. Full log. 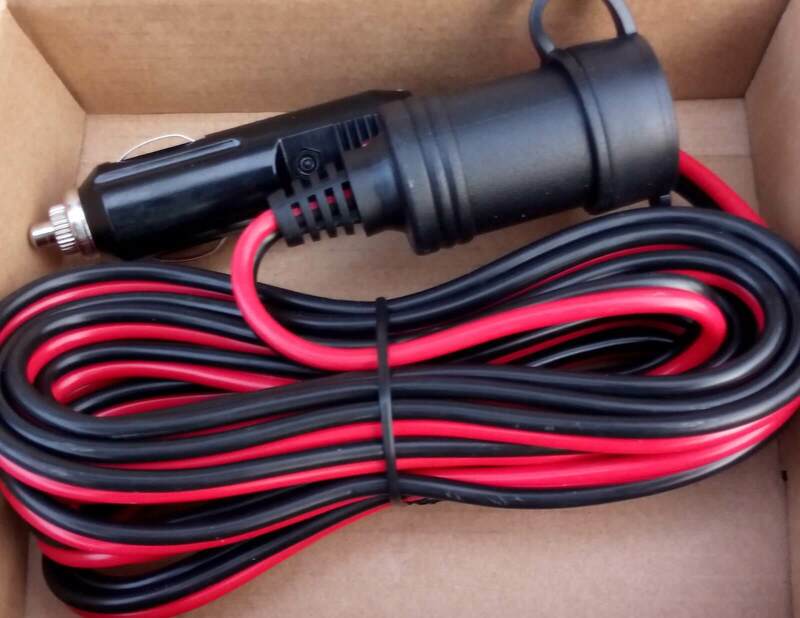 I ordered a KUNCAN 12FT 12V 24V 15A Male to Female Cigarette Lighter Plug Socket Extension Cord Charger Cord With LED Lights, Fused (£8.99) (in box and flying socket) to remove the plug from and permanently wire in as a robust (and coverable) place to plug the 12V kettle in. I also dug out my barely-used cheap 150W 12VDC to 240VAC 50Hz MSW inverter, plugged it in, and it does on the face of it seem to work, though the radio that I plugged into it was not very happy on MW. I now have more careful management of dump thresholds, based on an explicit SoC calculation including temperature and internal resistance compensation. The computed SoC is the grey line in the graph. It is positioned to match the 12.2--12.7V battery voltage that corresponds to the 0--100% usable charge that it approximately corresponds to. I added the Google "gtest" unit-test framework to allow me to verify a couple of the key SoC calculations. As a result I am able to better (safely) discharge and take the 'dump' load off-grid more (almost continuously). As a consequence the battery can then accept a decent charge the subsequent day. I have also been powering my MacBook from the off-grid system almost entirely, when at home. I may not have entirely trashed the batteries' capacity as I had feared. I may simply have been loading them over-cautiously. 2018/08/01: I think that the last time I plugged my laptop into mains power at home was back in June, so other than when I have been working elsewhere, all (50Wh+/d) of its energy has been off-grid. 2018/08/09: the heatwave has passed and we have near-normal British summer rain for now. I am moving my laptop back on-grid having beaten up the off-grid store today! Towards the end of August (27th-) I tweaked the control algorithm to interoperate with the Enphase grid-tied storage (~1.1kWh) installed at the start of the month. The intention was to better self-consume solar off-grid and grid-tied. So when the grid-tied system is spilling to grid, and the grid carbon intensity (or demand) is not too high, and the off-grid storage is not full, the off-grid system stops dumping to maximise charging, and retain that energy for later in the day. That seems to be working nicely, effectively adding up to 100Wh (~10%) to the grid-tied storage capacity (80Wh or ~5h has been seen several times). 2018/09/11: the battery may indeed be fading or I may have to tweak thresholds. Having been FULL up until about 4pm the previous day, the dump is dropping out after well under 200Wh dump-load discharge. That's <10% of nominal usable new-battery capacity, whereas even with my various conservative thresholds I should have four or five times that. 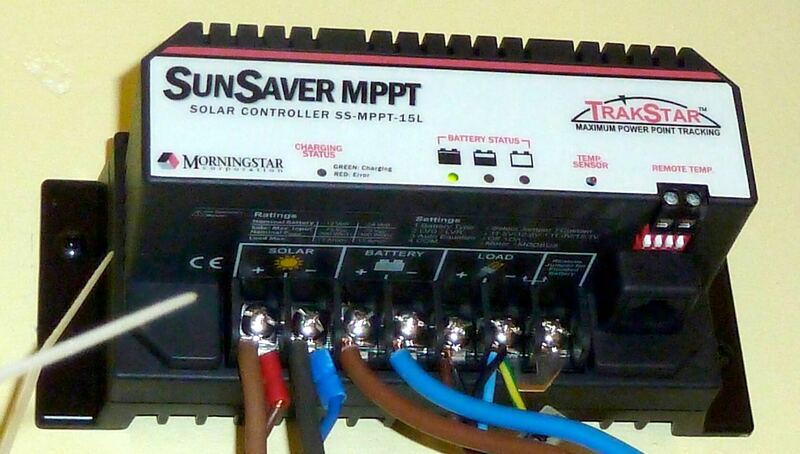 2018/03/26: Install tip: Oversize MPPT controllers in off-grid systems for more ROI. 2018/03/19: U.S. solar module to inverter ratio settles in around 1.25: "The DC-AC ratio of U.S. solar plants has been increasing since it measured at just over 1.1 in 2001-2009, however, the average seems to have flattened at just above 1.25 in recent years." Bimble Solar: "Affordable Solar Panels and Equipment". RPi System power management C++ source code, makefile and snapshots including powermng.cpp main module. 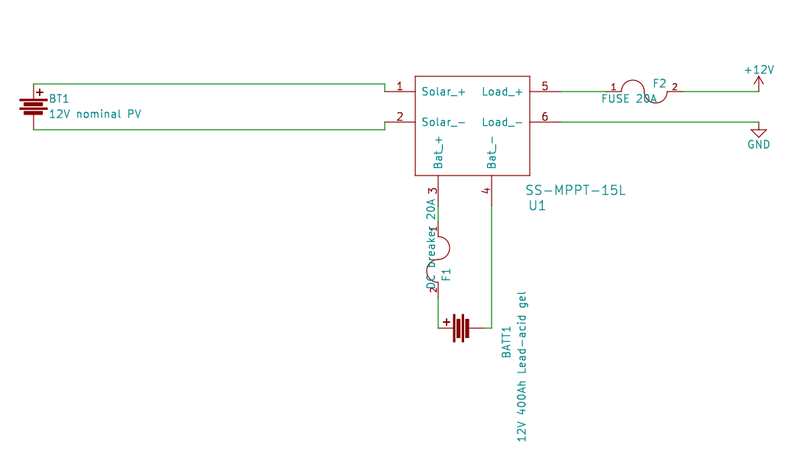 Off-grid PV system schematic (Ki-CAD). Effect of Winter on Battery Self Discharge. LTC4151 High Voltage I2C Current and Voltage Monitor: Voltage Range: 7V to 80V, I2C. LTC4358 5A Ideal Diode 9V to 26.5V. PV System Performance: Power Clipping aka PV "overbuild" AKA 'inverter loading ratio', ILR. 4x 8G27-DEKA - MK Battery 12V 99Ah (@C/100) gel batteries in bank integrated into the system 2011/01/14 and charging parameters. Note that an equalisation charge is supported for the gel batteries, though relatively gentle. First published 2016-05-29 , updated 2019-04-24 . Site copyright © 2007-2019 Damon Hart-Davis. Hosted by ExNet.